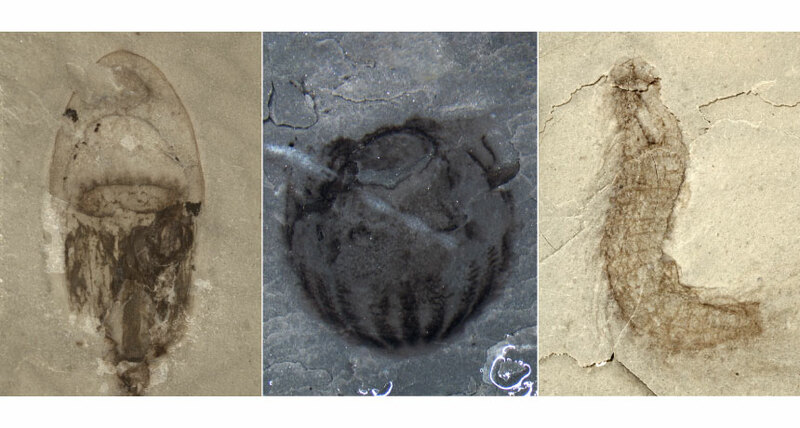 ANCIENT IMPRINTS The newly described Qingjiang biota, a rich fossil site dating to about 518 million years ago, helps document a rapid flourishing of diverse invertebrate life known as the Cambrian explosion. The fossils include abundant jellyfish (left) and comb jellies (middle), as well as a segmented, spiny animal that may be a kinorhynch (right). Along the banks of China’s Danshui River lies a treasure trove of fossils that may rival the most famous Cambrian fossil assemblage of all, Canada’s Burgess Shale. The roughly 518-million-year-old site contains a dizzying abundance of beautifully preserved weird and wonderful life-forms, from jellyfish and comb jellies to arthropods and algae. So far, researchers led by paleontologist Dongjing Fu of Northwest University in Xian, China, have collected 4,351 specimens at the new site, representing 101 different taxa, or groups of organisms. Of those taxa, about 53 percent have never before been observed, Fu and her colleagues report in the March 22 Science — not even at other well-known Cambrian fossil sites such as the 508-million-year-old Burgess Shale or a 518-million-year-old site known as Chengjiang, also in China. “It’s an exciting discovery,” says Jean-Bernard Caron, a paleontologist at the Royal Ontario Museum in Toronto who wasn’t involved in the study. During the Cambrian Period, which began about 542 million years ago, life diversified extremely rapidly. So many new forms appeared in such a relatively short period of time that this diversification is known as the Cambrian explosion. The find “shows that there’s hope for new discoveries” of other Cambrian fossil sites, he says.